Himalayas is a destination where one can find illusion as well as reality. The potentially of the great Himalayas is an unexplained force which will tempt travelers to visit and again. Of course, India has its own resources for adventure sports. A running event in high altitude is absolutely a thrilling experience and a new concept to Asian sports, it is First Asian country where multi-day state race in high altitude is being organized as an annual event. With fun and thrill, it gives a once-in-a lifetime experience. It is a 5 days stage run in the high Himalayas at an altitude varying between 6,600 to 11,815 ft. There are no specific rules, age bar, and stage cut-off time. Anyone, physically fit and interested can take part. The speed in running depends upon the individual runners. They can run or they can just walk. The run is designed for five days of 24-20-26-13-17 miles. The first stage starts from Maneybhanjang, covers 24-miles on trails and stop at Sandakphu. On the second stage runners will run to Molle and back to Sandakphu covering 20-miles. The third stage is 26-miles, out past Molle and then down to Rimbick. The fourth stage is for 13 miles on rural roads and finish at Palmajua. By covering 17 miles on the fifth stage the event will finish at Maneybhanjang. At each overnight stop participant are accommodated in rustic mountain huts with delicious meals. The route itinerary is stream lined with stocked aid stations including medical (doctor) facilities. Each day's running takes place at different altitude. The running starts at 6,600 ft. up to 11,815 ft. On second stage again up to 11,815 ft. While on third stage one can view Nepal to the West, it starts from 11,815 ft. and finish at Rimbick at 6,350 ft. Again fourth and fifth stage will go 8,555 ft then down to 6,600 ft. The view of 4 out of 5 world's highest peaks is an enchanting experience. The first annual ECM took place in 1995 at Sandakphu. This sets a comfortable pace of allowing acclimatization days to relax and enjoys spectacular views of Mt. Everest and Kanchenjunga at Sandakphu National Park. The marathon is run on a ridgeline footpath between 11,815 ft to 11,380 ft. from Sandakphu and back. The views of Nepal to the West, Sikkim to the north and Darjeeling to the east appear around run. Each event is an environment mission and presents the message of Himalayan conservation. 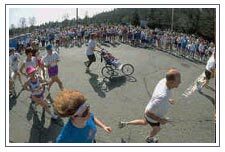 In October 1993, Mr. Bill Antholine, a professional environmentalist from USA, prepared Guidelines and Questionnaires relating to the Stage Race, distributed to its participants and asked to complete Questionnaires. In 1994 Mr. Antoline completed a 140 page Eco Travel Case Study and presented to Indian Tourism Officials and others concerned with conservation around the world. The study highlights that Eco - tourism can be defined as purposeful travel that creates an understanding of culture and natural history while safeguarding the integrity of the ecosystem and producing local economic benefits that encourage conservation.